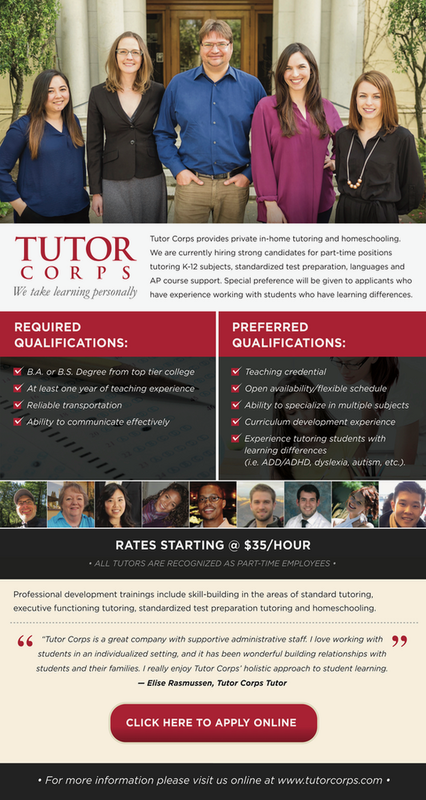 Tutor Corps is currently hiring high-level math (pre-calc, Calc, familiarity with Exeter math a plus), science (bio, chem, physics), and test prep (SAT, SSAT) tutors in Oakland and the East Bay. With Tutor Corps, you work one-on-one with students in their homes, build meaningful relationships, and help coach academic independence. We're also hiring tutors for all K-12 subjects, AP subjects, and other standardized test prep. Teach 12 hours a week and make up to an extra $2500 per month. Work as few as 5 hours or as many as 25 hours per week. Check out our tutor spotlight video and our informational video to learn why tutoring with us might be a good fit for you! Also check out our reviews on Glassdoor, Yelp, and Facebook. If you have friends who want to teach, please refer them -- we have amazing teaching opportunities for teachers and tutors throughout the SF Bay Area. We will thank you with a $100 referral bonus if we hire your friend (just have them put your name and email in the referral section of the tutor application). From Jesse Roselin, Founder of Tutor Corps: "I graduated from Marin Academy in 1995, Stanford in 2000, Teach for America 2000 Corps, and started Tutor Corps in 2002 to provide 1:1 quality education for all students. Tutor Corps has a corporate philanthropy model and the Tutor Corps Foundation 501(c)3 provides scholarships, community service grants, and awards to teachers. Visit www.tutorcorps.com/foundation to learn more." Apply online at www.tutorcorps.com/jobs. Scroll down for full description and list of locations.